The LEGO® Movie was released on DVD and Blu-ray today and I got my copy! As I mentioned in a post when the movie was first released in theatres, a few of my MOCs made it into the movie. Now that the movie is out I was able to get some screenshots. Check them out below! 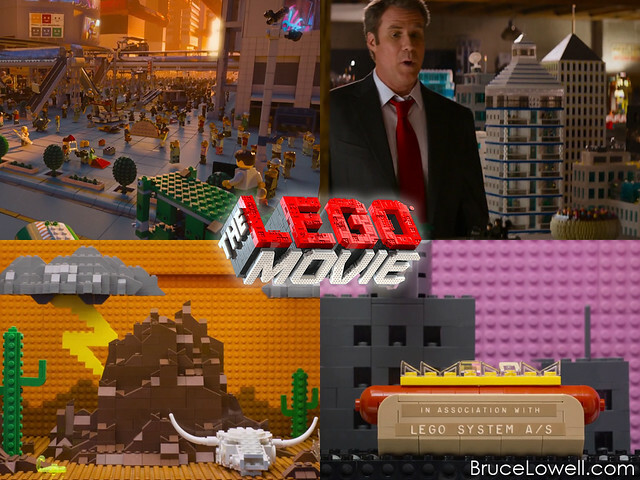 First we have my taco, which can be seen in the scene where Wyldstyle is encouraging the citizens of Bricksburg to fight back against Lord Business’ plan to rule the world. Two mini-figs can be seen carrying a deliciously huge taco across the plaza. Next, we have my donut. When Will Farrell (a.k.a President Business/Lord Business/The Man Upstairs) is searching for the Kragle, the donut is visible on one of the shelves, in the bottom left of the screen. My cow skull can be seen during the western vignette of the end credits. What’s even better is seeing it right below the legendary Morgan Freeman’s name. Lastly, my hot dog can also be seen in the movie vignette of the end credits, getting lathered with mustard and onions. Comparably cool with having Morgan Freeman’s name above one of my MOCs is having the LEGO® name branded one of them. There were a few more of my MOCs that were used on set for the live action scene that I haven’t yet been able to spot in the movie. My rubber ducky, however, did make into The LEGO® Movie Experience at LEGOLAND, California. If there are any other MOCs you noticed in the movie, be sure to let me know!